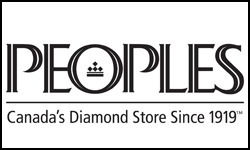 Founded in 1919, Peoples Jewellers is Canada's diamond store! Exclusively at Peoples, you can find the Celebration Canadian Diamond™ with 100 facets! From engagement rings to titanium men's jewellery, you'll find the perfect jewel at Peoples! Visit Peoples Jewellers at London's premier shopping destination, CF Masonville Place.